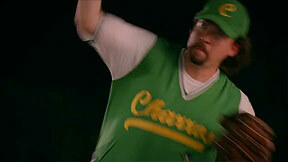 Coach Hernandez wants Kenny Powers to cut back on the showboating, and take things more seriously. Drawing from personal experience, he also offers some advice on how to handle the perils of success, like girls, binge drinking, and drugs. But the “depressing” speech has no effect on Kenny. Stevie takes it upon himself to re-open the Eduardo Sanchez case, but Kenny tells him to shut it down, that he no longer seeks answers that Sanchez may hold. But he is really interested, offering up more clues for Stevie to continue the investigation. While Stevie and Maria have their first encounter, Kenny takes Vida up to Sebastian’s mansion to use his recording studio. Her first single is about wanting Kenny to disappear ("by myself, by myself, by myself"), but he wants to re-write the lyrics to promote himself, and his influences on her life. At the next Charros game, Kenny Powers disregards every bit of advice that Roger had, by making another grand entrance into the game. Along with the Charros mascot, Kenny’s donkey pulls him onto the field in a cart, while playing Poison’s “Unskinny Bop", getting him kicked out of the game. The struggle for control in Vida’s recording career leads to some tension with Sebastian, and also frustrates his lady. Once again, Kenny Powers just cannot seem to take a hint, or notice that he is moving things way to quick for her liking, and she is not interested in a relationship. As punishment for his last stunt, Coach Hernandez benches Kenny for the next game. After this disappointment, Kenny goes looking for Vida at the studio, and walks in on Sebastian going down on her. 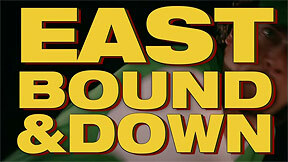 Kenny Powers completely flips out, and destroys the equipment in the sound recording booth. He returns home to find Maria and Stevie going at it on his couch, and makes Stevie dump her to make himself feel better for losing Vida. Reflecting on everything that has happened, Kenny gets wasted and shows up at the Charros game. Shoving his way onto the field and interrupting the game, Kenny Powers has a total meltdown that he dedicates to the fans. He “births” a soccer ball, shoots it out of the sky like a clay pigeon, throws the loaded gun into the stands, swings the mascot’s bat at the security guards chasing him, and quits the team.